Prime Minister Justin Trudeau says he is willing to consider helping Alberta Premier Rachel Notley fund the purchase of rail cars to in an effort to increase the quantity of oil her province can ship to international markets. Prime Minister Justin Trudeau says he is willing to consider helping Alberta Premier Rachel Notley fund the purchase of rail cars to increase the volume of oil her province can ship to international markets. Trudeau made the comments in a wide-ranging interview with Rosemary Barton, co-host of CBC News' The National, to air Sunday. Trudeau also floated the idea of boosting EI payments for jobless energy sector workers. "That's something we're happy to look at," Trudeau said when asked if the federal government would support the purchase of rail cars. "If that's a proposal that [Notley] thinks is going to make a significant difference, then we're happy to look at how it works. I mean, we're there to be a partner, to help." The comments come a few weeks after Finance Minister Bill Morneau appeared to reject the idea of federal support for the rail car purchase during an interview with The West Block on Global News. "Our estimate is it might take at least nine months, perhaps longer, to actually get more rail," Morneau said. "If that's a decision that the Alberta government and the industry wants to take, that's a decision that can be taken." In late November, Notley said she was weeks away from finalizing a deal that would see her provincial government purchase two new unit trains that could transport an additional 120,000 barrels a day, increasing the amount of oil being moved by rail in Canada by a third. "We're not wasting any time," Notley told a Canadian Club luncheon late November, formally announcing the rail car purchase. "Alberta's oil is going to flow one way or another — if not by pipelines, then by rail or by truck. "Don't mistake me — this is not the long-term answer ... But until pipelines are built, we need to move more oil by rail." Trudeau's response comes as tensions have increased between the Prime Minister's Office and the premiers, who are in Montreal to meet with Trudeau for the first ministers meeting. The tensions over the meeting became obvious during a conference call between the premiers on Tuesday afternoon. According to sources with knowledge of the call, several premiers voiced frustration with the draft federal agenda, which sets aside a significant amount of time to talk about issues important to the federal government and leaves only an hour for the provinces to raise their own priority issues. The main point of contention in the first ministers' agenda is the plan to give three federal cabinet ministers — Morneau, Environment Minister Catherine McKenna and Intergovernmental Affairs Minister Dominic LeBlanc — two hours and 45 minutes in the middle of the day to lead discussions on trade and competitiveness, climate change and interprovincial trade barriers. The premiers' roundtable which follows is set to run only 60 minutes. Late Wednesday, the PMO reached out to CBC News to say that the ministers will only be speaking for a few minutes at the beginning of their part of the meeting before premiers are invited to voice their concerns. Saskatchewan Premier Scott Moe and Notley want a significant amount of time set aside to discuss the challenges now facing the oilpatch. Ontario Premier Doug Ford threatened this morning to walk out of the meeting if the agenda isn't changed to reflect the premiers' priorities. Alberta says about 190,000 barrels of raw crude oil and bitumen are being produced each day that can't be shipped out. To help reduce the glut, Notley ordered a temporary 8.7 per cent cut to Alberta's total oil production — a decrease of about 325,000 barrels a day — starting Jan. 1. 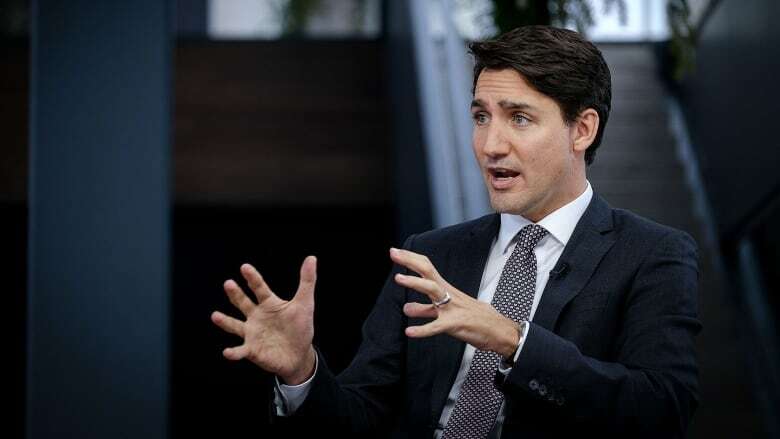 Trudeau suggested the federal government could ease the pain for the energy sector by temporarily extending Employment Insurance benefits for affected workers. "We're absolutely looking at the tools we have around EI," Trudeau told Barton. "We are looking at tools we have around income support. "We've done a number of things around that ... and we're going to continue to do that. And I'm also willing, of course, to sit down with Premier Notley and hear about how the federal government can be a partner in solving this solution in real ways." In 2016, Trudeau extended additional EI benefits to workers in particularly hard-hit areas of Saskatchewan and Alberta. Workers were given an additional five weeks of benefits, with long-tenured workers eligible for an extra 20 weeks, up to a maximum of 70 weeks. Tune in to watch Rosemary Barton's full interview with the prime minister Sunday Dec. 9 on The National at 10 p.m on CBC Television (9 p.m. ET on CBC News Network).